A long-standing puzzle regarding the nature of disk galaxies has finally been solved by a team of astronomers led by Ivan Minchev from the Leibniz Institute for Astrophysics Potsdam (AIP), using state-of-the-art theoretical models. 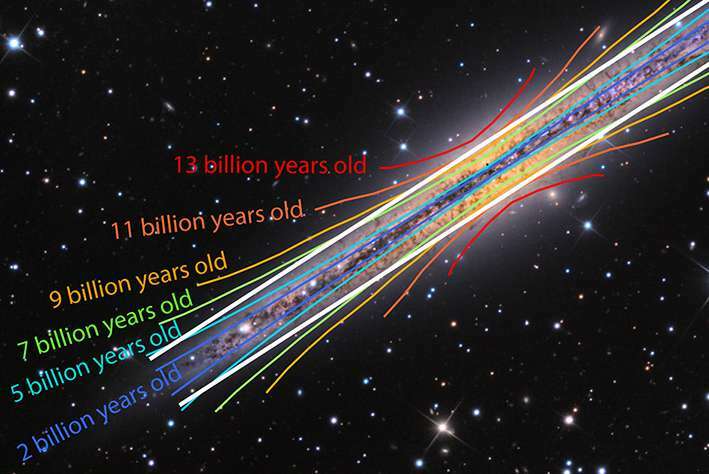 The new study shows that groups of stars with the same age always flare as the result of massive galactic collisions. When taken all together, these flares, nested like the petals of a blooming rose, puff up the disk and constitute what astronomers call the "thick" disk. "We were able to show for the first time that galactic thick disks are not composed only of old stars but must also contain young stars at larger distances from the galactic centre", explains Minchev. "The flaring seen in groups of stars with the same age is caused mostly by the bombardment of small satellite galaxies. These cosmological car crashes pummel the young disk and cause it to swell and flare." To arrive at this new result, the team ran numerical simulations on massive super computers and examined the structure of their simulated galaxies. The scientists grouped stars by common age and looked at where they were located. What they found was that stars of a given age group constituted a disk with flared edges, much like the mouth of a trumpet. This flaring is unavoidable, being caused when the main galaxy collides with smaller galaxies – a generic feature of how scientists believe galaxies form. Since the oldest stars formed in the inner region of the galaxy, for them this flaring occurs closer to the centre, while for the younger stars it occurs at the periphery of the galaxy. When put together, the combination of flaring from all the stars produces the elusive thick disk, as observed. One of the most fascinating aspects of galaxies is that their stars can be separated into two components: a fluffy thick disk that enshrouds a thin disk. Until now the understanding has been that stars in the thick disk were the oldest. In observations of the Milky Way the oldest stars are found to be closer to the centre, while younger stars are more extended. Scientists agree that this separation is likely due to an "inside-out" formation scenario, wherein the Milky Way forms stars first in its center and later in its outer region, much like how cities grow radially from a medieval center to modern suburbs. Observing the structure of the Milky Way is tricky, since we are located within its disk, roughly half way from the centre. Instead, astronomers have to rely on the stars that surround us and build a model from this limited perspective. Nevertheless, if the Milky Way were similar to other galaxies and its thick disk were composed only of old, centrally concentrated stars, then one would naively expect its thick disk to be short. But in other galaxies the thick disks are observed to be as extended as the galaxies themselves. Minchev's results resolve this contradiction by requiring that thick disk stars become younger in the disk outskirts. "With our new understanding of the formation of, and interplay between, galactic thin and thick disks, we have moved much closer to solving one of the most fundamental problems of Galactic astrophysics. ", concludes Ivan Minchev. "Our predictions will soon be tested with data from the Gaia space mission and using high precision instruments, such as MUSE on the Very Large Telescope." Another conundrum reduced. Good stuff here. As analyses and simulations of galactic evolution become more refined this work will make a major contribution. It's also good evidence to support the model in which big spiral galaxies accrete from multiple absorptions of small galaxies. .........and even bigger Ellipticals accrete from multiple absorptions of all sizes of Spirals. That actually made sense, Benni. Now, if you had a link to a reputable source, and a quote from that source that shows it supports your contention, you'd be golden. How does this un-layer backward in time? Is it possible to predict a set of events between each epoch? The larger the galaxy the younger the formation (in general) but the older will be the constituent Stars as they pre-date the galaxy itself due to mergers combining formations. However when you compress multiple gas formations to make new stars this obfuscates things. Also collisions of old stars could make "new" stars, and collision of a "brown dwarf" with an older star could re-invigorated it with a large amount of "new" hydrogen, making it appear "younger" even if both objects were actually very old. All these sorts of things have to be considered carefully.